Many-To-One, Many-To-Many and Many-To-Many Objects are pure relation data types, which means they represent a relation to an other Pimcore element (document, asset, object). The Many-To-One and Many-To-Many data types can store relations to any other Pimcore element. In the object field definition there is the possibility to configure which types and subtypes of elements are allowed. The configuration screen for restrictions is shown below. The Many-To-Many Object field allows relations to one or more data objects, but no other elements. Therefore the restriction settings for objects are limited to object classes. The width and height of the input widget can be configured in the object class settings. For a Many-To-One relation only the width can be configured, since it is represented by a single drop area. Lazy Loading is explained further below in the section about relations and lazy loading. 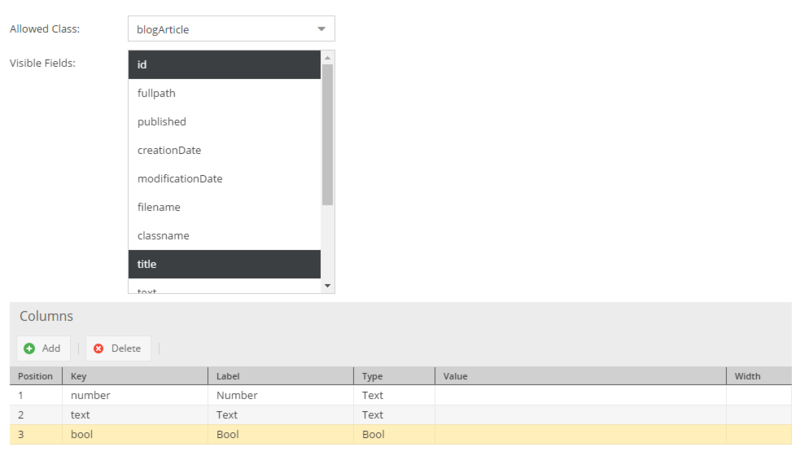 The input widgets for all three relation data types are represented by drop areas, which allow to drag and drop elements from the tree on the left to the drop target in the object layout. This data type is an extension to the Many-To-One Object data type. 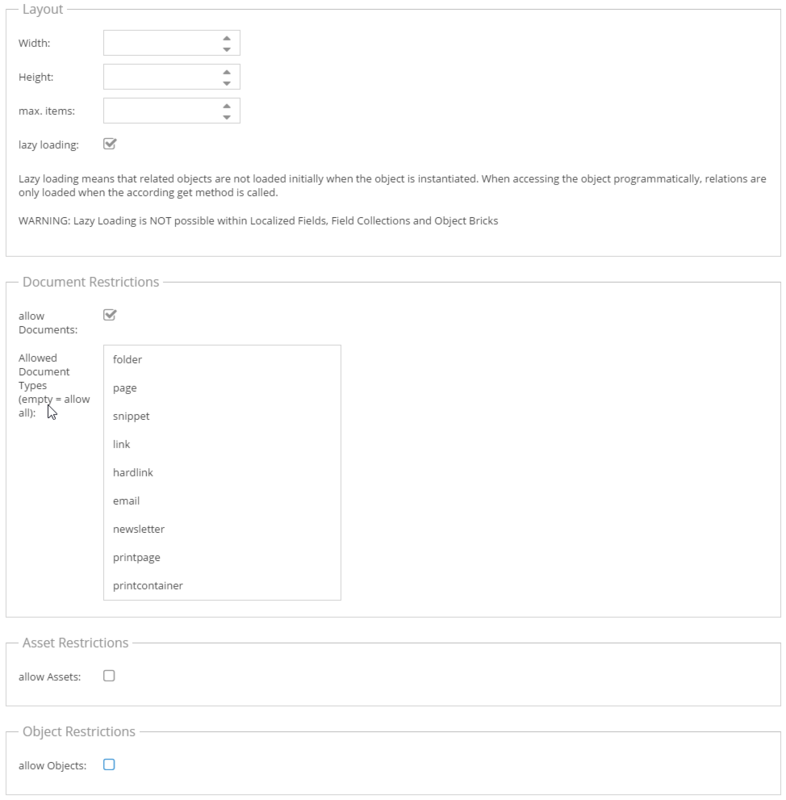 To each assigned object additional metadata can be saved. The type of the metadata can be text, number, selection or a boolean value. This datatype is similar to the Advanced Many-To-One Object Relation data-type in the way that additional information can be added to the relation. 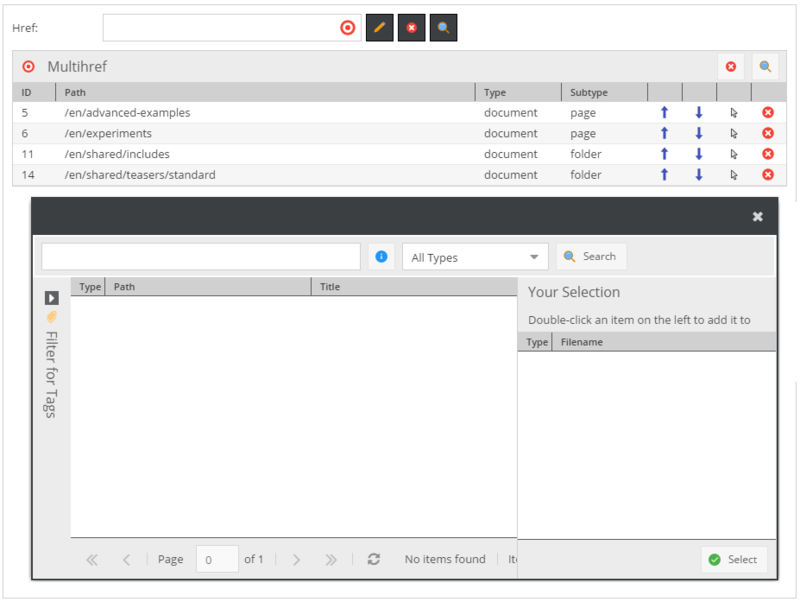 The main difference is that all element types (documents, assets and objects) can be added to the relation list. The element types can also be mixed. Essentially, the same rules as for the standard Many-To-Many Relation apply. Whenever an object is loaded from database or cache, all these related objects are loaded with it. Especially with Many-To-Many relations it is easy to produce a huge amount of relations, which makes the object or an object list slow in loading. As a solution to this dilemma, Many-To-Many relational data types can be classified as lazy loading in the class definition. Attributes which are lazy loaded, are only loaded from the database/cache when their getter is called. In the example above this would mean, that the Many-To-Many relational data is only loaded when calling $object->getMyManyToManyField();.